If you hear any or all of the above lies politely decline their offer then telephone the police. Tell the police that there is a possible home improvement scam occurring in your neighborhood and you would like them to investigate. At the very least they are violating the Door to Door Sales Act. You should also alert your neighbors and friends so they do not fall prey to the scam. No literature, business cards, or written contract outlining guarantees, warranties, terms and/or services. No company name on vehicle. A lot of rental equipment. They request a deposit. Seal coating should never require a deposit! No MHIC # and poor excuses/lies why they don’t have one. Many “Jackals” use a material called GILSONITE to seal coat driveways. Gilsonite turns a nice driveway into a sticky, tacky, smelly mess that will be tracked into your house by anyone or anything that has the misfortune of stepping on your driveway before they step on your carpet. 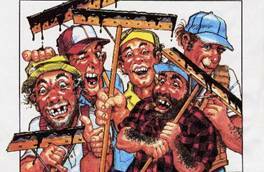 Gilsonite is an asphalt cut back that is sometimes used as a pavement rejuvenator in controlled applications. However, less scrupulous companies have brought this product to the residential market. They usually dilute the product with kerosene, gasoline, or other petroleum distillates. Coincidentally, petroleum distillates are among the materials that lead to asphalt decay. 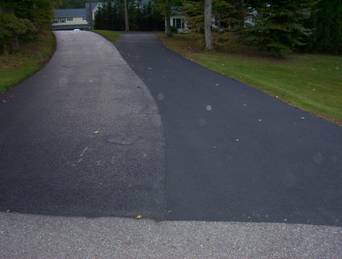 Coal Tar Emulsion sealer and Asphalt sealer, the materials we use, protect your driveway from these substances. Gilsonite is illegal in many states. Unfortunately, it can still be purchased in Delaware, Pennsylvania, and several southern states. The left side of this common driveway in Huntingtown was coated with Gilsonite less then 10 hours before Chesapeake Sealcoating Co. sealed the right side with our professionally blended Coal Tar Emulsion sealer. The Gilsonite was still a tacky, streaky, smelly mess two days later when this picture was taken. In comparison our driveway has a nice thick, dark, rich protective coat that will last for years to come. The homeowner on the left stopped payment on his check (too late) and called me to see if I could fix what the out-of-state scam artist did to his driveway. Unfortunately, the Gilsonite has to wear off before we can apply our superior product which will protect the driveway.